Succose novità da parte di Aaron J. Seigo su Spark, il tablet con base Mer, che monterà Plasma Active e che verrà venduto a € 200. Sul suo sito ha pubblicato una serie di domande e risposte sul tablet che ci danno molte informazioni su Spark. Il tablet sarà in preordine a partire dalla prossima settimana e le vendite effettiva a partire da Maggio 2012. Altra notizia importante per noi italiani è che il tablet verrà lanciato prima in Europa, quindi non ci toccherà aspettare come sempre l'altro lato dell'oceano. Emergono informazioni aggiuntive sul tablet come la presenza di una webcam frontale da 1,3 megapixel, risoluzione schermo 800x480, 2 porte USB, uno slot microSD, un jack audio da 3.5mm e modulo wifi standard 802.11 b/g. In una fase successiva sarà prodotto una variante dello Spark con modulo 3G (BYOS: Bring your own SIM. ;) e GPS. A: Pre-order registration will open early next week. This was one piece in the puzzle that was taking a bit longer than I had hoped for to come together, but it's finally slotted in and our distribution partner has got the necessary infrastructure settled. I'll lift the veil off of the pre-order and our distribution strategy when it goes live. Q: When will Spark start shipping? A: We expect to start shipping Sparks to you starting in May 2012. We have a lot of pieces to coordinate, and not just technical issues like the OS image and the content add-on store, but things like packaging design, manufacturing, shipping, import, retail channel coordination. So far we're on track, but I don't want to offer a more precise date than "May" until we pull the trigger on production. Q: Where will it be available? A: It will be available for order online worldwide. We will be focusing primarily on Europe first, but we will be able ship worldwide from day one. We are looking for retail partners elsewhere in the world: USA and Canada, South America, Australia, etc. to make it easier to procure. Q: Can we customize the Spark for a specific use case, such as education, industrial control or vertical integration with an application? A: Yes. The Spark is the perfect device for customization and project-specific integration. It is completely open and can be altered to suit your needs. We believe Spark to be the device most suited to adaptation for vertical applications available today. Depending on order volume, we can even ship Sparks to you with your customizations pre-installed and offer pricing incentives. A: Yes, it has a 1.3 megapixel webcam on the front. Q: What is the screen resolution? Q: What ports does it sport? 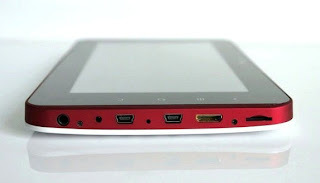 A: It has 2 USB ports, a microSD slot, a 3.5mm audio jack and, of course, power. A: Yes, standard 802.11 b/g. A: Yes, though this does void the warranty. Q: Can I get one with built-in 3G and GPS? A: Not in the first run of devices. We do plan on providing Spark models with 3G (BYOS: Bring your own SIM. ;) and GPS later. Q: Can I get a Spark with higher-end hardware? A: We are currently evaluating higher-end hardware options and intend to expand the product line over time. Our requirements are not simple, but we have already started to identify candidate systems. As with 3G, when this happens will be driven by market demand for Spark. Q: How will software add-ons be delivered? A: You will be able to use the standard Mer repositories as well as the Open Build Service. However, that's not overly person friendly (unless that person happens to be technically adept and familiar with Linux), so we are providing an add-on store from which people can easily download and install books, applications, desktop widgets and services .. with more to be added with time. Q: I'm a developer and I'd like to write something for Spark; how can I do that? A: We recommend QtQuick for applications targeting the Spark. There are also KDE libraries, including the Plasma framework, on the device. However, Spark is happy to support non-Qt apps. I play Battle for Wesnoth on mine. ;) Developers will have access to the add-ons store as well, so getting your apps to Spark users will be dead simple. Q: So can I sell apps on Spark? A: Yes, you will be able to sell apps and content to Spark owners. We will be announcing details and opening up developer registration a little closer to the Spark release. Q: Is the add-on store Free software? A: Yes, the client will be GPL'd from day 1 and we would love to see other people making products take advantage of that. The store is not Spark, Linux or even software specific. The back-end will be released as open source once we have proven the design and implementation in production circumstances (we have written it twice already, learning a lot of great lessons in the process). Should the projects fall over and die, however, we will release the source code immediately under a permissive F/OSS license. Q: Can I make video calls with the Spark? A: We do not expect to have Skype available on the Spark, though it might happen eventually. There is work on nice Plasma Active of Telepathy for this purpose however. It's even on the official Plasma Active 3 tasks list and if it is ready in time we will integrate it into the Spark OS image. Otherwise, video calling software that runs on Linux and builds on ARM should do the trick. Q: Can I install / boot something on a Spark other than what ships with it? Q: Can I install the OS on a different tablet? A: Depends. Plasma Active already supports a variety of tablets. We don't have the resources to make it run on every bit of hardware out there, nor can the Spark effort focusing on polishing other device support at the moment. However, there are images for Intel based tablets as well as nVidia Tegra 2 and other ARM tablets available, and you can help by getting involved with the amazing Mer project. It is our hope that Spark will ignite interest in other vendors as well who will pick up the opportunity to increase the diversity of options. Yes, we're looking to grow what would traditionally called competitors. We see them as co-conspirators. ;) Welcome to the world of Open. Q: Does Spark use the Android kernel? A: No, for a few reasons ranging from legal to practical. While you can install Android on the device, we're very happy to support the Mer community and overjoyed with the support we've received from them in return. Q: Can I run Android applications on the Spark tablet? A: Not currently. (Though, of course, you could decide to install Android on it yourself.) It is theoretically possible to package a Dalvik runtime for Plasma Active and make it available on the Spark. No one has attempted this yet, but it would make for a killer project. Q: Is the Spark based on the Zenithink C71? Q: Does that mean I will be able to install Plasma Active on a C71 device I purchased elsewhere? A: Yes, that's all in the spirit of openness. However, if you break it, you get to keep both pieces. :) Keep in mind that by purchasing a Spark you will help drive development of Plasma Active, Mer and the push towards an open ARM ecosystem. Q: There are no GPL compliant sources for the C71, right? A: We are aware of this, and we've been working on it. It's been one of the hardest things to accomplish in the entire project. Q: What about other projects also working on GPL compliant devices? A: Yes, we are aware of such great projects as Rhombus Tech's work with Allwinner on their A10 chipset. (I have an A10 device on my desk right here, actually, and have been evaluating it for a few months.) There is more than just a chipset at play to make a tablet, but it's a critical first step. We're also aware of the Mali open source driver initiative, and take our hats off to Codethink and Luc for that! We are excited to see more and more Free software projects in the ARM hardware world. We've had Linaro for a while, but the concept of making low cost, widely available ARM devices from a variety of sources is only now beginning to take root. We will continue to evaluate all the possible solutions out there as we continue to develop Make·Play·Live devices. We are also committed to work with other projects working towards open devices. It will take all of us to bring openness to the device world and to make great devices for people to own and use on their terms.